Cocktail Party "The Gift To Sing" Something to Sing About! Our second annual cocktail party and auction - "The Gift to Sing" - was a great success. Thank you to everyone involved... sponsors, attendees, auction winners, our young singers, our committee and board of directors, our staff and volunteers, and our guest auctioneer Gary Lesser. Guests were all thrilled to hear beautiful music from a quartet of DSOA students and of course many of our own young Singers, led by conductors Terrion Nelson, Erica Barnes and Shawn Berry. Read more about Cocktail Party "The Gift To Sing" Something to Sing About! (left to right) Supporters of Young Singers of the Palm Beaches children’s choir and Choir in the Glades are (left to right) Gary Lesser, Alexander Dreyfoos, Ken Dwyer, Hank Gonzalez and author James Patterson. (left to right) YSPB Artistic Director Shawn Berry with Lynn Delaney and Robert Delaney, long-time YSPB Supporters from Gold Coast Federal Credit Union. On Saturday, Dec. 22, Yesteryear Village hosted Christmas in the Village, offering an old-fashioned celebration among the historic buildings. 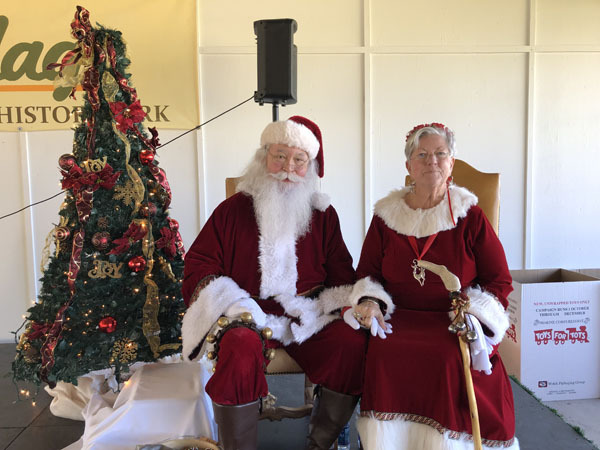 The day featured visits with Santa and Mrs. Claus, food trucks and performances by the Young Singers of Palm Beaches. It was a peaceful and entertaining holiday event. Oliver Goodman practically was born with a song on his lips. That’s according to his father, Palm Beacher Dean Goodman. The Young Singers of the Palm Beaches is thrilled to have Radio City Rockette Lori Barber Ramirez choreographing numbers for the group’s upcoming holiday show, Winter Dreams, and teaching the singers dance routines. Ramirez has been working on the choreography for YSPB’s upcoming concert, which will be on the main stage of the Kravis Center for the Performing Arts on Saturday, Dec. 8 at 7:30 p.m. 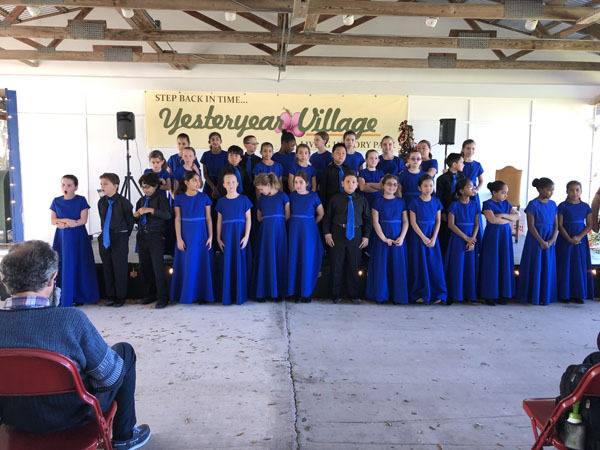 Treat yourself, your friends and family to a magical evening of song with the highly acclaimed Young Singers of the Palm Beaches. Audiences are continuously impressed with the youth choir’s experienced voices and high level of choral performance. This year’s Winter Tapestry Holiday Concert, Winter Dreams, will envelop you in the spirit of the season. A wide breadth of musical styles and songs will be featured, from Classical to Pop, Broadway favorites, and more. The 350 young singers’ performances will tug at your heart strings and fill you with laughter and joy. In the mood for some holiday music? Witness 350 young singers on stage at the Kravis Center for Young Singers of the Palm Beaches’ annual holiday concert, “Winter Dreams.” The signature performance will include classical music, pop, Broadway hits and, for you toe-tappers, a fun sing-along segment! This local youth ensemble delivers on talent and quality, year after year after year, so don’t miss out and bring the whole family with you.